I’m so damn excited because in a few days, I’m off to Sydney, Australia! Literally, cannot wait to get on a plane. (Minus the 17-hour air time…) As you guys already know, I’m a huge fan of traveling, and a bit of a horrible packer. But, that’s a topic for another day. Today, we’re talking about this kinda-perfect-travel-outfit, PLUS things I cannot survive without on my travels. The entire outfit comes together when you add a leather jacket. I ALWAYS carry a light jacket with me on the plane, because it usually gets cold, and no one wants to cover up in one of those polyester airplane blankets. Flats. Seriously, everyone needs to stop wearing high heels on airplanes. It does you NO good and I’ve seen too many women struggling. You can wear flats and still look chic. Trust me. These babies from ASOS are the perrrrfect example. Okay, let’s move onto a few travel must haves! Swipe Deodarant wipes. These are your life savers right here!! You know when you’re stuck on an airplane and you think you smell, because after 8 hours your deodorant starts to wear off? And then you’re running to the bathroom to wash your armpits? LOL. Fear not. 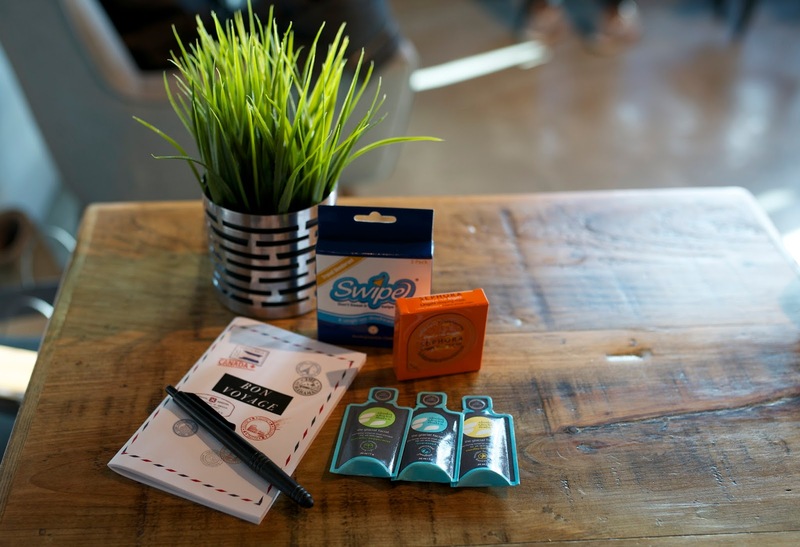 Swipes, are these amazing little deodorant wipes. They are seriously the best thing of life. Everyone needs to carry them. And they aren’t just for traveling. I always carry a few in my purse no matter where I am. You never want to be in an awkward situation where you think you may smell of B.O. Sephora Sleep Masks. I’ve talked about these sleep masks before. You guys must know by now how obsessed I am with the health of my skin and of course, facial masks. These masks are the perfect travel companion. They go on clear so the person next to you won’t freak out. They have so many amazing benefits to them and lots of different types of masks. The Moisturizing and Soothing one is the one I love traveling with. Right before I’m about to sleep on a long flight, I put this all over my face. The air in an airplane can be so harsh on your skin. This mask is perfect because it hydrates my skin and doesn’t leave it feeling dry and flaky. You can fall right asleep with this on your face. No need to worry about washing it off. Once you wake up, if you feel the need to rinse it off, you can. Alaska Glacial Mud Masks. Another amazing mask. These are different from the ones above. Not recommended on the airplane as it will go on looking like goop on your face. But hey, if you’re comfortable with that, go with it! So, another mask that I love traveling with are these Alaska glacial mud masks. You can read all about the amazing benefits here, there are TONS! They come in these little adorable, travel-sized packets that won’t take up much space at all. When traveling to different countries, you never know how your skin will react to certain weather temperatures, foods, water, etc. These masks are perfect for taking care of your skin when on your travels. They detox, exfoliate, soften, and nourish. What more do you need? Notebook. I’m a blogger. So, I carry a notebook with me at ALL times. But especially when I’m traveling. I’m always jotting down the best spots to eat, local bars, restaurants, spas, sights to see, etc. This travel notebook from Sabri Studio is adorable and comes with me on all my travels. DO expect a blogpost on Sydney, Australia when I’m back! I’ll have all the must see/do’s of Sydney for you. Also, if you guys have any recos, PLEASE share below! I’m going to be in Sydney for 9 days, so let me know if there are things I have to see/do! I hope this post helped some of the travellers out there. If you guys have things you cannot travel without, do share in the comments. Okay, I’m off to a pretty productive Monday! Lot’s of work wrapping up and then packing! Next Post Back From Sydney + My Holiday Look.